Are you someone who when you feel tired or overwhelmed with your work, you start checking emails instead? Why do we do this? It is the same reason why we start with small simple tasks rather than the tougher, more complicated ones. A lot of productivity gurus suggest starting with your most difficult or time consuming task first thing in the morning. However, this can be tough for many of us as we crave that immediate satisfaction of being able to complete things, meaning we go for the easy wins. Checking and processing emails is one of those activities. A common recommendation is to not check email in the morning, but to rather batch it and schedule time to process email 2-3 times throughout the day. It is important to remind ourselves that the world still goes on when we ignore emails, and to instead handle them during specific and dedicated times. This also encourages people to contact you in real-time with urgent matters. However we know many of you don’t like this structure for managing emails, and prefer to constantly check email to maintain a clean inbox with no emails and by dealing with emails immediately – which is ok as long as your day is not over-taken by email. 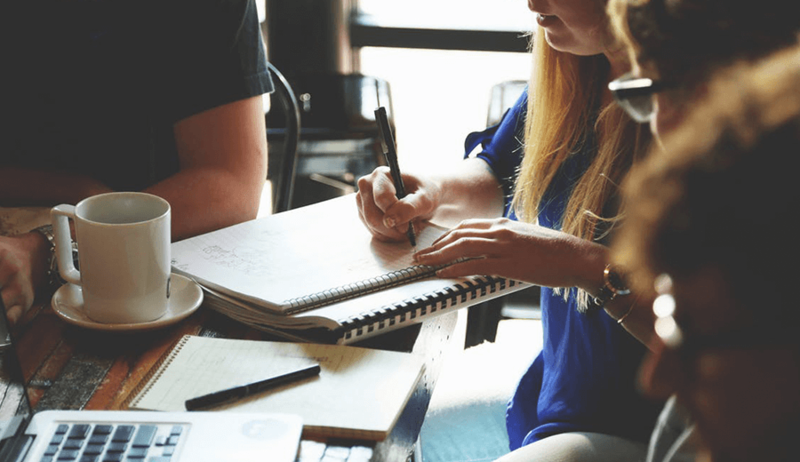 For some of us, we may not need to separate email from real work, but accept that it is a part of work and building professional relationships in the exchange of information. This is great as long as we can remain effective with email. We know, it feels good to check email, but what about the rest of your time and how it can be spent wisely?  We quickly realized that there are small wins in a stress-free email hub that achieves true inbox bliss. 1) Speed Reader At least 50% of online reading is spent reading emails. What if you could cut that time in half? 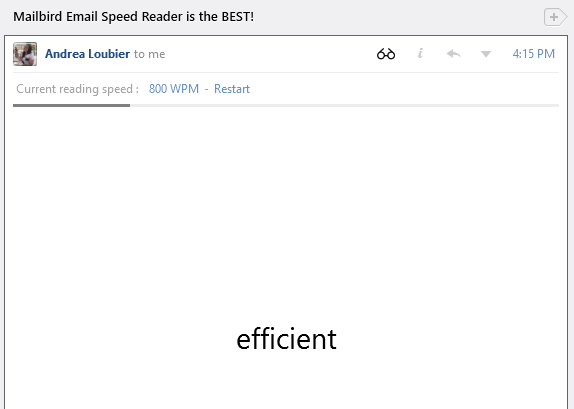 Use the Mailbird email speed reader to get through reading your emails in half the time. 2) Quick Compose This is a keyboard shortcut that you can create to compose an email anytime in a fly, whether Mailbird is the active window or not. This is great for when you just remember to email someone after browsing a website and you quickly want to send them a link to that website. Or maybe you are working in a word document and you have a question from your colleague. You don’t need to open Mailbird so it is the active window, just use your keyboard shortcut to start composing. 3) In-line Reply Let’s say you finish speed reading an email and there are important and specific points you need to reply to. Using in-line reply gives you and contacts in your email conversation a well-organized response that is easy to follow, with automatic color coding and your name stamped wherever you hit enter in your senders email to reply to that specific point. 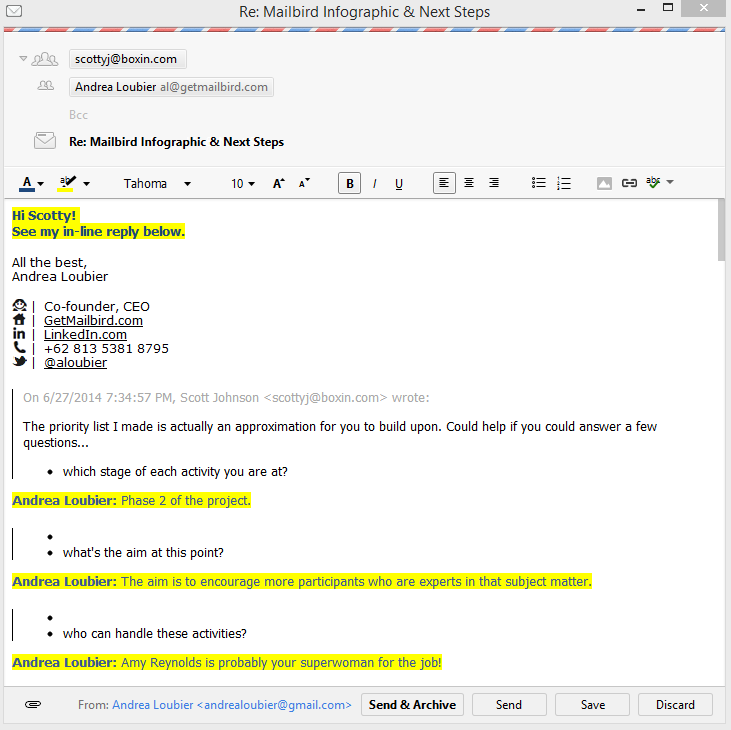 This of course can also be customized from the Options menu under the Advanced tab to whatever color and text stamp to distinguish your responses from the sender’s original email content. 4) Keyboard Shortcuts Keyboard shortcuts, even for those who are used to mouse point and click interactions are actually a very rewarding way to speed up email management. You can use “R” for replying, “L” to label an email to a designated folder, “F” to forward an email, “Ctrl + Shift + P” to print, “Delete” to move emails to trash, “E” to archive and much more. Best of all if you use Gmail keyboard shortcuts, many of them are already supported in Mailbird – making it much easy to learn. 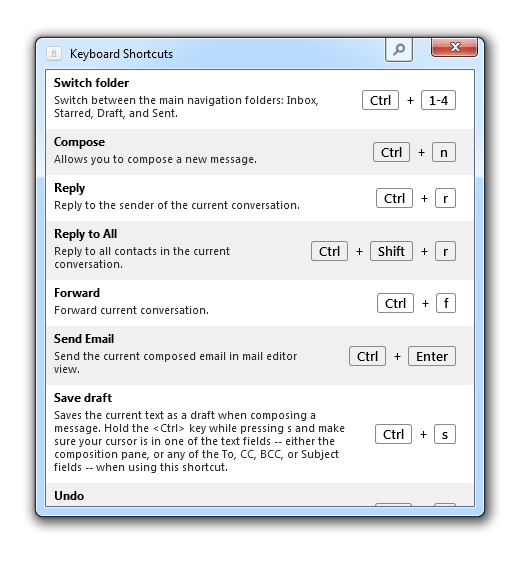 To see how much faster you can get to reaching inbox zero using keyboard shortcuts, check them out by hitting Shift + ? to see all the available shortcuts. 5) LinkedIn Lookup This is ideal for people who really use email as an integral part of their work where they are building professional relationships. 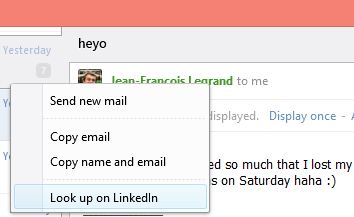 Right click on any email contact and select “Look up on LinkedIn”. This automatically looks that email contact up on LinkedIn so you can build a stronger connection with that person, especially if they are a business contact. This is really a bonus to staying socially connected via the Mailbird Facebook app. 6) Multi-account support The main reason why many people opt for a desktop email client is so they can manage several different email accounts from one place from different email servers. Imagine never having to worry about remembering another email login and password, or the internet cutting out, or adjusting to different email interfaces and all the features that matter to help improve your experience with email. 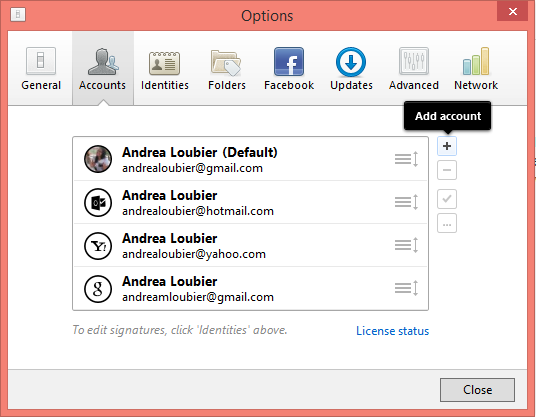 Multi-account support allows you to also customize your accounts with different icons, and multi-identities allows you to send from any email address from any one account. It’s one place to handle all your email. 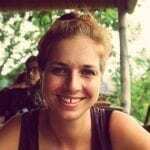 Multi-account support allows Mailbird to be your email hub. You can learn more about why desktop email is better than web email here. 7) Action Bar This is a definite dynamic addition to managing your inbox. When you hover over the profile picture of your contact in the message list a bar slides out to the right giving you the options to Archive, Reply, Forward, Trash, Mark as important, Mark as starred, Mark as read or unread and Mark as spam. So if you are a point and click type of person, this is a great way to manage your emails immediately, otherwise you may be one of the keyboard shortcut efficient email users as noted in #4 above. Finally, you can easily archive emails my either clicking and holding down on a profile picture and dragging to the right and the bar turns Green to confirm your email will be archived. Alternately if you have an email that is archived or in a folder, you can move it back to the inbox using the same gesture only the bar turns Blue to confirm the email is moved back to the inbox and will be tagged with Inbox. For laptop users, you can use the touch pad mouse to archive or move emails back to the inbox using two fingers and swiping them from left to right on the touch pad mouse. Pretty awesome. 8) Profile Pic Search For those of you who don’t follow the inbox zero philosophy of cleaning out all emails from your inbox, all your problems are solved as long as you have an awesome search function that allows you to search for any content in emails like subject, content and sender. You might say “Who needs to delete or archive when I can find any email through a robust search algorithm in my email?” and maybe you don’t feel any positive benefit for ridding your inbox of all emails as soon as they arrive. Search is the answer to your email woe’s, and still allows you to process emails in the most productive manner ever. 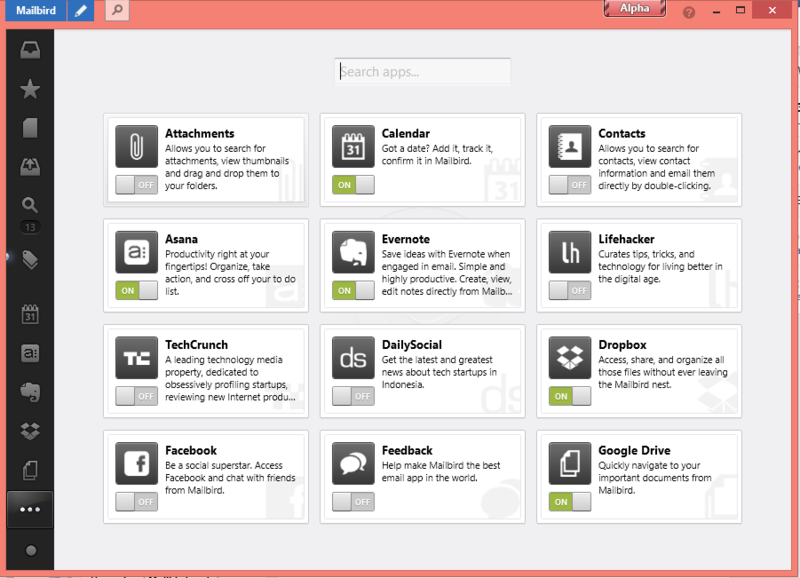 You can even search for attachments, keyboard shortcuts, apps, contacts, folder labels and much more. The really special search function that seems to shine is the ability to search for all emails from one contact in one click, working as an instant filter. Click the profile picture of your contact in the message list pane and magically all emails from that person appear in the message list pane. This email secret is perfect for referencing older email exchanges between you and your contact. 9) The Apps This is a very special part of Mailbird that allows you to use Mailbird as one place to get work done. 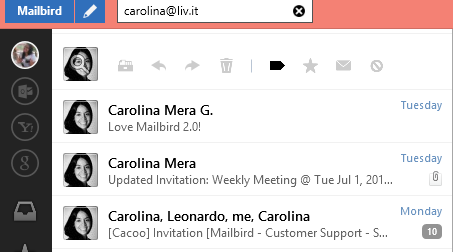 To view the current prototypes of Mailbird apps click on the three dots at the bottom of the navigation pane. This will open the apps currently available. To turn them on simply click or slide the on/off switch for the app you’d like to use. Once you do this, it will appear on the far left navigation pane. Click on it to activate and enjoy a whole new dynamic inbox with awesome apps like Evernote, Dropbox, Google Drive, Google Calendar, Asana and much more. So we understand that we all have different email management methods, and no one or the other is right or wrong. Instead Mailbird allows you to customize your email experience through many effective features that help you feel good again by reaching a clean or simply more manageable inbox. Less stress and more time for the rest of your life! Why doesn’t every email client have these? 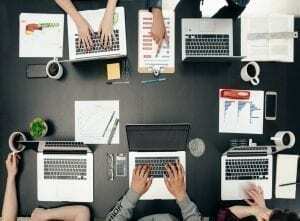 7 thoughts on "Best Kept Email Secrets"
I think this article is great.. In fact everything you write seems to be top-notch. Way to go. Pointed out some items here I knew but also found the other ones I had hidden in the cracks of my brain. You guys are doing great! Keep up the great work!! Is it possible when opening attachments for them to open full screen on top instead of opening on the task bar where another click has to be used to see them? Does Mail Bird have a spam filter? So I have spam coming from an email address that is cleverly mine. I finally got a reply from the provider saying it doesn’t exist when I tried to reply, but it uncovered the true address. I want to put that into my spam filter….but…does Mail Bird have one or not?? Is there a way to do something similar to Outlook’s Quick Parts? 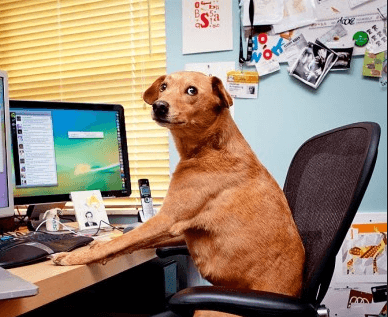 Or save a template containing information that I regularly respond to in an email so that I don’t have to type the same information over and over again?